The release of Michael Jordan's signature shoe has always been a huge day for basketball collectors and sneaker heads. The newest edition has been dubbed the Air Jordan 11 Retro Concord and pays homage to the 11th installment of Jordan's shoe, the Concord. The original Concord sneaker coincided with Jordan's 1995 NBA comeback after he left the game to try his hand at baseball. It was also featured on Jordan's family film, Space Jam. Because it is a retro version of an original sneaker, it is considered a variation and is not the official 2011 or 2012 Air Jordan. See all the previous Air Jordan versions from 1985 to 2011. One would think that since Michael Jordan hasn't laced up his kicks in the NBA for several years that there wouldn't be a ton of demand. That certainly wasn't the case with the release of the Air Jordan 11 Retro Concord. Despite the struggling economy, many people braved the winter weather and large pre-Christmas crowds for a shot at buying the $180 shoes. When the sneakers were first available on December 23rd, long lines and reported violence filled the news in the aftermath of the release. Many eager fans went home empty-handed and were forced to look to other sources to obtain the elusive sneaker that had become an instant collectible. As with many other collectibles, eBay has emerged as the prime destination to get the hard-to-find Air Jordan 11 Retro Concord. From the moment the shoes were first offered, prices shot through the roof. 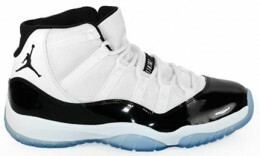 In the days after the release, pairs of the Air Jordan 11 Retro Concord were selling for over $1,000 a pair. Now that the initial demand has subsided, prices have settled in the $200 to $400 range. Clearly, something has resonated with collectors and expectations will be bigger for all subsequent releases. Although the official announcement for the standard version has not been made, images of the alleged 2012 Air Jordan Black/White have already leaked online and a purported pair was recently offered for sale on eBay.